These reductions have often done more harm than good. Moving past these tired clichés and providing a deeper historical analysis is essential to understanding many events associated with the Arab uprisings, including the current protests in Jordan. For the Jordanian state, the turning point came in 1989. It was at this point that the country’s political economy transformed as a result of IMF-imposed structural adjustment programs and a ‘neoliberal’ economic project. The first of a string of protests erupted, in response to cuts to the country’s fuel subsidies. The events of 1989 broke the social contract between state and society, which was never repaired. Over time, a dysfunctional dynamic developed in which the Jordanian state was no longer accountable to its citizens, but rather to the political, economic, and ultimately, imperial interests of the United States and international financial capital. This neoliberal system also altered the systems of production in Jordan, giving rise to a new and increasingly disconnected elite that controlled much of the country’s economic and political capital. This article will attempt to shed some light on this system and the social structures that have been created and destroyed over the past twenty years in Jordan. The academic Larbi Sadiki coined the phrase dimuqratiyyat al-khubz (“democracies of bread”), to refer to the implicit social contract between rulers and the ruled in authoritarian states in the Arab world. According to this model, Arab rulers paid for political deference from their people with publicly subsidized services. Here, the word khubz (or “bread”) is applied to all government social services, including health care, education, and employment. Like many of its neighbors, Jordan had entered into this authoritarian social contract with its people. The Jordanian regime established itself as a semi-rentier state supported by a growing and contented middle class. It was a central supplier of employment and social welfare programs, and was able to provide subsidies on basic consumer goods. Through these well-establish neo-patrimonial networks, the government was able to suppress dissent throughout the state. As the regime fell into a debt trap in the early 1980s, this social contract came unraveled. When the oil recession of the 1980s brought a series of economic shocks, Jordan was, at first, unwilling to reduce spending or impose austerity measures. Instead, it borrowed increasing amounts of money from foreign lenders. By 1988, Jordan’s external public debt stood at US$ 9.8 billion, which was double the country’s GDP. It was not until the spring of 1989 that the regime finally agreed to a five-year plan with the IMF for ‘economic adjustment and stabilization’. The government’s decision to accept the IMF’s structural adjustment policies was not, however, a constraint-free choice. After all, by 1989, the government was close to bankruptcy and had exhausted all potential avenues for foreign aid. The country’s hands were, therefore, tied, and any foreign lender, be it the United States or others, required that neoliberal “economic adjustments” be made. Once it had agreed to the loans, the IMF granted Jordan US$275 million in funds. In exchange, the IMF pressured the government to immediately cut subsidies on consumer goods, and on April 16th, 1989, the government announced a variety of price increases, including on beverages, cigarettes, cooking oil, and gasoline. In response, riots broke out predominantly in Jordan’s southern cities, killing eight people and injuring around 100. 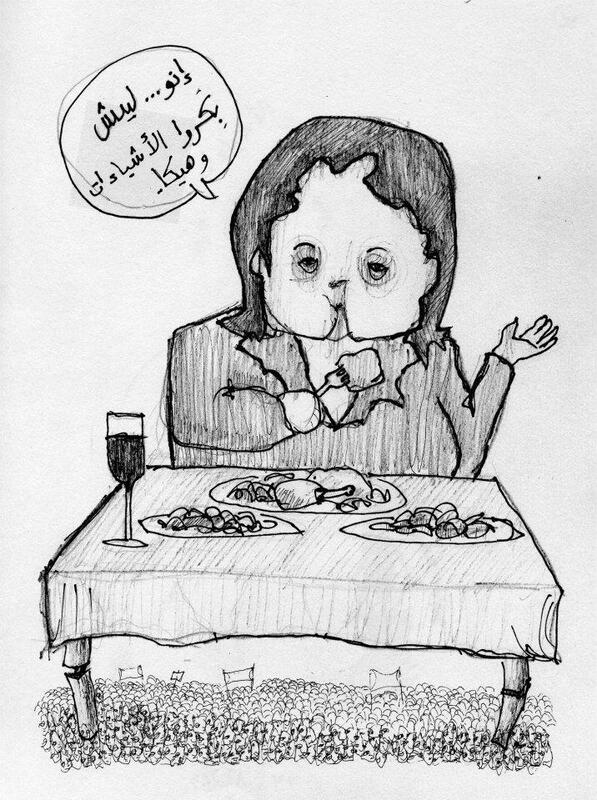 The social contract between the Jordanian state and its citizens was broken, and dimuqratiyyat al-khubz was dead. To minimize the damage, the Jordanian regime promised political liberalization. This included a move to rescind martial law, end censorship, and legalize political parties, which had been banned since 1957, including the Islamic Action Front. These gestures of political liberalization were, however, hardly intended to signal moves toward ‘democracy’. Rather, the purpose was to strengthen the business elite and co-opt the opposition, particularly the Islamic Action Front. For instance, the return of parliamentary life gave business owners greater opportunities to affect government policy. Indeed, business people were able to secure their influence and power in Jordan by lobbying members of Parliament and forming strong political coalitions. In fact, in breaking the social contract with its people, the Jordanian government strengthened its ties with this business and elite community. Historically, Jordan’s King Hussein had used the country’s robust public sector to co-opt traditional notables, emerging bourgeois, and professional elites by dolling out positions within the state bureaucracy. The most prominent examples of these co-opted individuals were the munfatihun, the emerging business elites that primarily consisted of importers, financiers, middlemen and profiteers. Along with international financial institutions and Western powers, it was actually this class, which pressured King Hussein for economic reforms along the lines of the ‘Washington Consensus’. In 1996, the Jordanian government removed additionally subsidies, most controversially on bread. This triggered a second round of riots. This time, emboldened by the consolidated power of the new business elite, the Jordanian state reacted with more force, threatening to use an ‘iron fist’ to restore order and arresting members of leftist parties. What had changed to trigger a stronger response from the regime? There are many factors, but one that is typically ignored is that between 1989 and 1996, the State (which included both the business elites as well as the regime itself) exploited IMF-led neoliberal reforms to strengthen its hegemony over the country’s wider population. For instance, in the second half of the 1990s, the regime carefully selected public enterprises for sale to ‘strategic investors’ in order to reduce the government’s budget deficit. These strategic investors were little more than extremely wealthy Jordanians who enjoyed social and political ties to the palace. Even Jordan’s 1994 peace treaty with Israel, which was strongly opposed by the wider Jordanian population, reflected the interests of a cosmopolitan leadership that drew its identity from renewed engagement with international elites, while shutting down dialogue with Jordanian civil society. As a result of neoliberalization throughout the 1990s, a new form of patrimonial capital became entrenched in Jordan. This was a hybrid of informal, socio-political remnants from Jordan’s rentier economy combined with the formal institutions and new policies of market capitalism. Today, the Jordanian economy relies almost entirely on external aid to finance expenditures. As a result, the country’s systems of production do not depend on the people. State accountability to citizens is, therefore, non-existent. Instead, the Jordanian government is accountable to only a small and increasingly centralized business elite. This elite is connected to international financial capital and the interests of those who control the international financial architecture, namely, the United States and by extension the IMF. Global capitalism feeds upon a neo-colonial ideology of dependency, which plays out in different guises across much of the debt-ridden ‘Global South’ (which is now expanding to countries such as Greece and Spain). When it comes to Jordan, the U.S. role is pivotal. Over the last twenty years, Jordan’s financial prospects have been intimately connected with its position on U.S. imperial projects in the region. For instance, during the Gulf War, Jordan immediately felt the economic repercussions of sitting on the fence: foreign aid was cut off and the Jordanian port of Aqaba was blockaded by U.S.-led frigates to prevent supplies from reaching Iraq via the Jordan border. This inflicted heavy damage on the Jordanian economy. In response to this experience, Jordan soon realigned its position toward the war to suit Washington’s interest. Foreign aid to Jordan soon resumed its regular course. The forces and principles of what social scientist Stephen Gill terms ‘disciplinary neoliberalism’ were also at play in the 1994 peace treaty between Israel and Jordan. By signing the peace treaty, Jordan netted a $900 million write-off of its debt. Aid levels to the country increased to such a degree that Jordan became the fourth largest recipient of U.S. economic and military assistance in the world. Since 2001, Jordan has strategically places itself firmly within the American ‘war on terror’ camp. At the same time, since 9/11, the United States has embedded itself in Jordanian politics to an unprecedented degree, even helping to write the country’s draft income tax law in 2009, according to USAID Fiscal Reform Project officials. U.S. involvement in Jordanian affairs weakened the Jordanian state while strengthening the country’s extrajudicial security apparatuses. Why did security become so important? – because the discipline-and-control functions of the state were necessary for the free flow of transnational capital into and out of the country. In 2012, under the guise of “inevitable economic reforms,” the Jordanian government took steps to reign in a bulging budget deficit and secure a $2 billion loan from the IMF. In November, Jordan’s prime minister announced price hikes for gas and other fuels, setting off the most recent round of demonstrations and calls for general strikes across the country. In today’s Jordan, inequality is more noticeable than ever, and the middle class continues to shrink. The business elite of West Amman, meanwhile, continues to defend the government’s decision to cut subsidies as ‘inevitable’, and lauds its efforts to co-opt and coerce dissenters, which include Islamists, trade unions, and leftist groups. 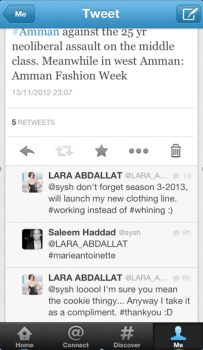 While the protests were breaking out throughout the country in November 2012, in exclusive West Amman, Amman Fashion Week was taking place. When I tweeted about the contrast between the two events, the following exchange took place between myself and a Jordanian model and former beauty queen (see photo, right). Sadly, such responses from the Jordanian elite are often the rule rather than the exception. In the bars, restaurants, and five-star hotels of West Amman, the disgruntled ‘help’ serve an elite that sees the need to service debt and destroy the ‘corrupt’ public sector as essential to economic growth – no matter that this is done at the expense of securing a safety net that can ensure equitable economic and social development for all socio-economic groups in the country. Jordan’s neoliberal experiment has resulted in the restructuring of its political economy to sustain U.S. imperial and economic interests, as well as the interests of transnational capital, while undermining the socio-economic needs and political rights of the majority of Jordan’s population. At the same time, the IMF’s role over the past twenty years in breaking the social contract between the Jordanian state and its people is a critical part of understanding the current protests. The resilience of the Jordanian protesters is a testament to the fact that, beyond the current wave of subsidy reforms, the Jordanian street is utilizing Arab Spring ‘fever’ to demand a more comprehensive and much needed re-orientation in its broken contract with the Jordanian state. *Saleem Haddad is a staff writer at Muftah. These structural adjustment programs and wider neoliberal project were underpinned by the ‘Washington Consensus.’ According to economist John Williamson, the Washington Consensus embraced ten policies of economic liberalisation: measures to promote trade and foreign direct investment, fiscal discipline, fewer subsidies, tax reform, liberalised financial systems, competitive exchange rates, privatisation, deregulation and measures to secure property rights. What is striking about the government crackdown is that the Islamist opposition was treated somewhat benignly. In a televised speech at the time, King Hussein claimed that the Islamist opposition had behaved responsibly, even though it had vocally opposed the price hikes before the lifting of the bread subsidy. Posted on November 27, 2012, in Capitalism, Middle East and tagged IMF, Imperialism, Jordan, Neoliberalism. Bookmark the permalink. Leave a comment.